Tattoo :: .Identity. – Can’t Save Me NEW! Cap :: ::Fe Style:: Snapback V.3 003 NEW! Pants :: *chronokit* Parachute Sarouel Pants Navy NEW! Car :: ..::P&W::.. M34 NEW! Leaving it all behind me as I take a family vacation to the East Coast. For too long, my mind was congested with negativity, but now in the cool breeze surrounded by history, I can breathe a sigh. It’s what I’ve needed for a full year. Breakups, job losses, losing loved ones, etc. Whatever you may have been or are now going through, just take a step out of your comfort zone and breathe. Okay, so I sound like Dr. Phil or something, but it is what it is. As someone who has a fear of flying, I have to thank my friends and family for pushing me onto the plane, almost literally. This week will be worth it! Shirt :: [R3] – Tyson Shirt M [V3] NEW! It’s Christmas time and we’re all busy little elves, shopping, decorating, partying it up. Luckily I’ve found the time to toss out some new releases. This mesh “Ultimate BEAST” cap from LogiQue is my favorite. It comes in both flat rim and turned up (as pictured below). 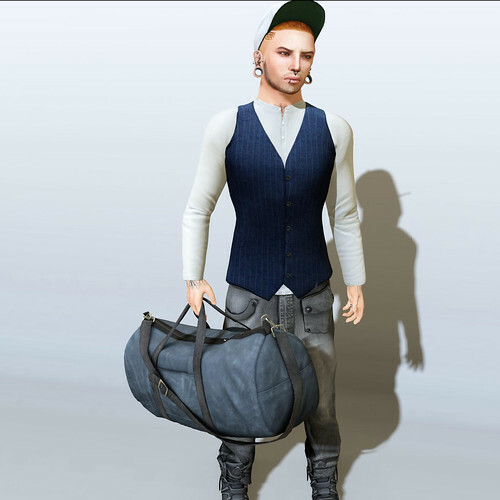 Next is a new facial hair from ::Fe Style:: featured at Fi*Fridays. I’ve got a little ‘stache and chin fuzz working. Last, but not least, are the piercings from Zombie Suicide. They are unisex and fit perfectly with just a bit of adjustment. Once they’re in place, just give it a click and you can change the color of the stones. Pretty nifty! Sweater :: [Roy] Black Sweatshirt -AVG ..